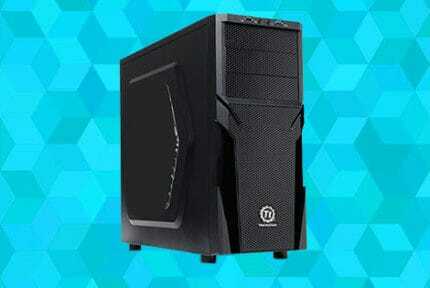 A budget of $1000 can net you a reasonable PC, especially if you build it yourself. 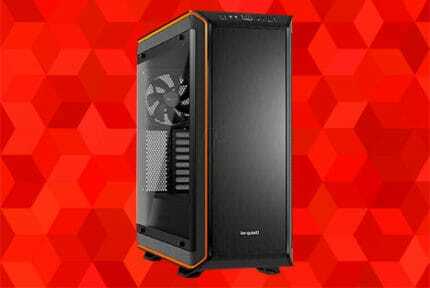 We’ve spent dozens of hours to pick the best parts for a $1000 PC build and continue to do so in order to keep it up to date with the constantly evolving PC market. You don’t have to spend your own time researching and possibly learning difficult technical lingo. We’ve done all that for you. Let us dive right into the ultimate $1000 PC build! This is the best and most cost-efficient gaming rig in 2019. If you’re willing to save and spend a lot more money, then you should see our $1500 PC build guide instead. The most powerful mid-range CPU with unmatched single core performance and great overclocking potential. It may not be the most powerful air cooler on the market, but the DEEPCOOL GAMMAX 400R is definitely better than its low price would have you believe and certainly good enough to get the most out of this build's CPU, provided there's no overclocking. The RTX 2060 is everything gamers have wanted the RTX GPUs to be from the start. It will propel your gaming experience to new heights, opening doors to many new possibilities like 2K resolution, Streaming and VR, all at a reasonable price. 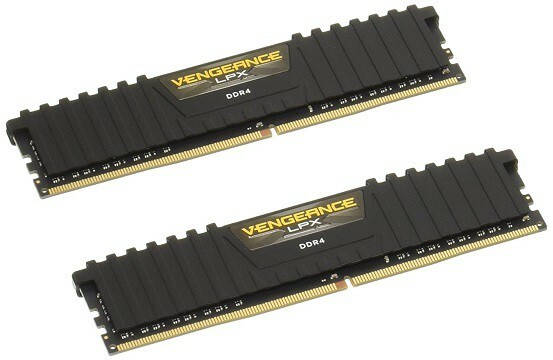 The Corsair Vengeance LPX RAM stick has it all - both great performance and a truly enticing price tag. The Z390 not only works wonders with this particular build, but will last you through numerous upgrades with features such as CPU overclocking and multi-GPU support. It also supports Intel 9th-generation CPUs out of the box. 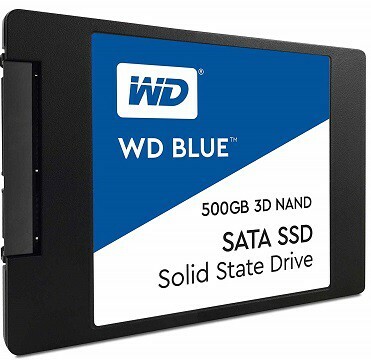 If what you're looking for is a fast, reliable and reasonably priced SSD, the WD Blue 3D NANA has got you covered an all accounts. 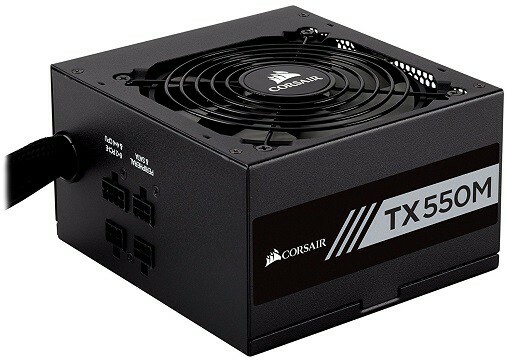 A real semi-modular beauty, the Corsair TXM550M is an admirably power-efficient PSU that can handle things getting a bit heated up. 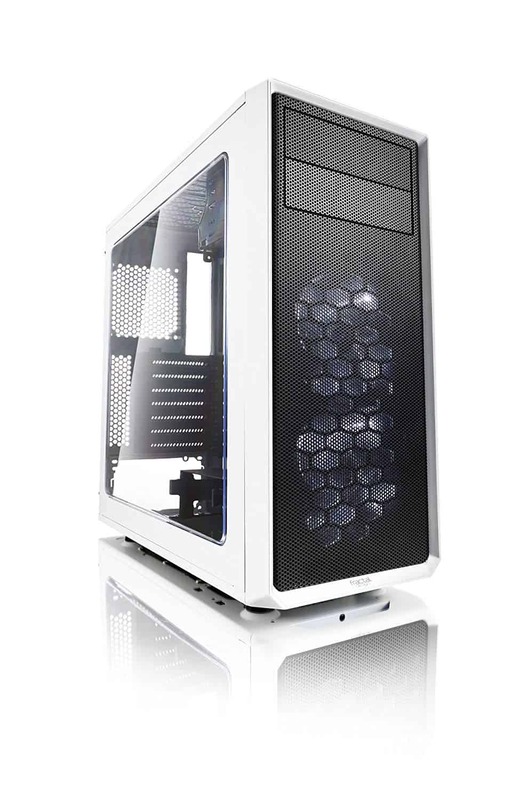 The Fractal Design Focus G is an excellent case that has both some weight to it and excellent airflow, with two preinstalled case fans to boot! Now you may be wondering, what exactly does a $1000 PC entail? After all, while this much cash may not afford you the ultimate gaming PC rig, it’s no spare change either. So we’ve made sure that this PC is ready for anything. Playing games is a given, obviously. But not every PC allows you to play games the way they were meant to be played. So we’d like to be more specific. This build will let you play any game you want in 1080p resolution at the widely-coveted for 60 FPS. Even the most poorly optimized resource-intensive games like Assassin’s Creed Odyssey will not drop below 60 FPS. So you can just select the ‘ultra high’ quality preset in any game without giving the individual options a second glance. It also goes without saying that gaming in 2K is an option, but more on that later. However, what really sets this PC apart from most sub-$1000 PCs is that it’s also Streaming and VR ready. These are both very resource intensive tasks so you’ll have to scale down the graphics a bit, especially for VR, but nevertheless, it’s an excellent entry point for you to try out both of these and see what all the fuss is about and whether they’re worth your future investments. We also made sure to keep upgradeability in mind when picking out the parts and even gave it some overclocking potential, but we’ll talk more about that as we walk you through each of the components and discuss what exactly it is that they bring to the table. So let’s take a look at each of the components we’ve handpicked for this $1000 build and see what makes them the best. We’ll also present you with some alternatives so that you can customize the PC more to your specific needs. If you have an even higher budget, then see our $1500 PC build. And if your budget is lower, we recommend that you see our $600 PC build guide instead. The one thing that was constantly on our mind as we were making this build was upgradeability. It’s one of the most appealing points in PC’s favor and honestly, not taking advantage of it is a huge waste. 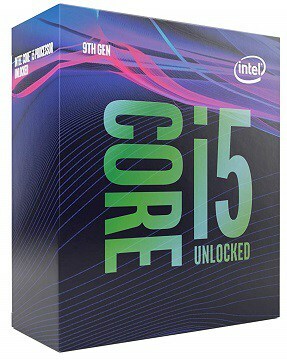 As such, we’ve decided to go with the first and, most likely, best CPU in the line of Intel’s 9th Gen i5 processors – the i5-9600K. The ‘K’ at the end means that this model can be overclocked, giving it added value and longevity. There was decent competition for the CPU spot here. Before the 9th Gen i5 processor got released, this build featured the i5-8600K. The Ryzen 5 2600X and i5-8600 are both excellent alternatives if you’re looking to cut the cost a bit. The new i5-9600K is a bit more expensive than the i5-8600K was at the time of writing, bringing the overall price some $20 above the $1000 threshold, but we feel that the benefits this bring outweigh the slight cost increase. In all honesty, though, this CPU can be considered a bit overpowered for the rest of the build, so you wouldn’t be sacrificing much in terms of gameplay by opting for one of the slightly weaker models. Still, the reason we chose it is very simply: upgradability. You won’t upgrade your processor nearly as often as you will your graphics card. Once we decided that what we needed was not just a CPU that good in its own right but one that can still keep on running without any hiccups even after you trade in your graphics card for a better one, the decision became easy. The i5-9600K is a beast, to put it simply, with an unmatched single core performance in this price range. It’s not significantly more powerful than the previously featured i5-8600K, but this model is no longer available on Amazon, we decided it was time to upgrade. You can pick out a good cooler. Basically, this is something that’ll let the CPU just work as normal, take it out for a spin (no pun intended). And this is exactly what the DEEPCOOL GAMMAX 400R does. This quiet and efficient cooler with four heatpipes will let you get the most out of your monster of a CPU. What more, it comes with all the tools necessary to install it, so it’s a real hassle free solution. Now while it’s not a bad choice by any means, if you’re interested in doing some overclocking, then a good cooler won’t suffice. In this case, we recommend getting a great cooler, one that can really push your CPU to the max and take advantage of its overclocking potential. 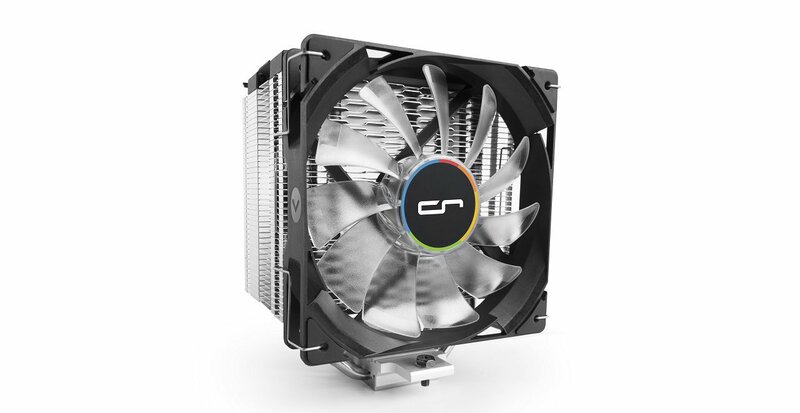 If this is the case, then you’ll likely want something along the lines of the Cryorig H7 Quad Lumi. Now here’s where thing get spicy. 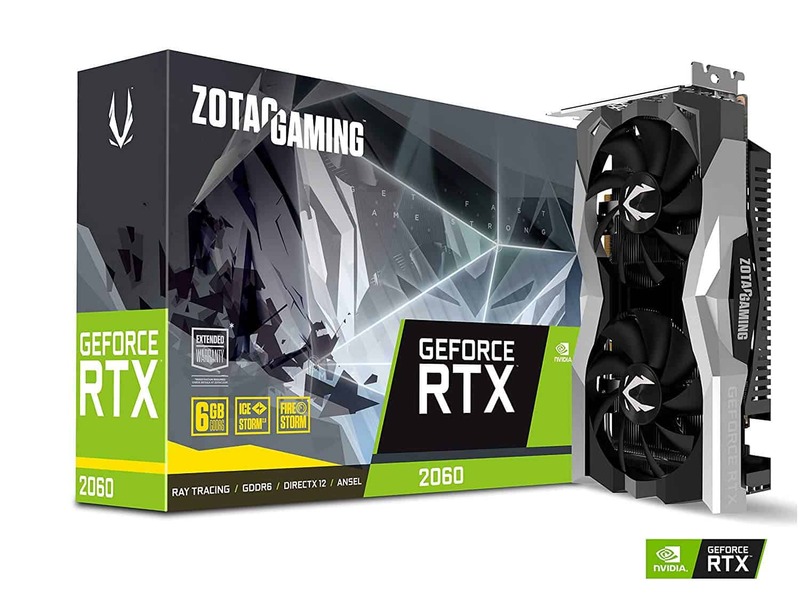 We’ve selected one of the new RTX GPUs – the incredibly ZOTAC Gaming GeForce RTX 2060 – to take care of the graphics. We know that the RTX cards didn’t receive the warmest reception by gamers (although this is likely to change once more games start utilizing ray tracing), but they are still technically superior to their predecessors in every way. Plus, the biggest problem with the previous RTX iterations was that they weren’t exactly cost-effective, instead using the fact that there’s nothing else quite like them on the market to astronomically ramp up the price. Not the RTX 2060 though, as this is the most cost-effective RTX GPU to date. For example, it costs about as much as a new GTX 1070 does, but it outclasses it in every way other than VRAM capacity (the RTX 2060 has only 6GB of VRAM to the GTX 1070’s 8GB, however the GDDR6 memory on the RTX is way faster!). So the value for your money is definitely there this time around. And as for performance, well, as we’ve said, you’ll be able to max out the graphics settings in 1080p even in the most resource demanding games without about the framerate at all. It can even confidently push into 2K territory, with 60FPS quite easily attainable if you tinker with the graphics options a bit. And the two 90mm Ice Storm 2.0 fans will keep the graphics card cool and quiet in either case. The only possible downside to this graphics card is that it only features a single HDMI port, which can be inconvenient if you’re gunning for VR. Still, we prefer the port arrangement as it is since this rig is more than powerful enough to run a triple monitor setup, but the hardware will struggle to get the most out of VR. You’ll want nothing short of the RTX 2080 to run VR games in the highest settings, and a more powerful CPU as well. 8 GB is the bottom line for gaming right now. It’s not as if current games demand more, but background processes are becoming more demanding by the day. Google Chrome alone is known to eat up several GBs of RAM when you’ve got multiple tabs open. And even if you meticulously close all unnecessary background processes when gaming, you may still need to have Steam running, or Discord, and you’re one step closer to hiccups. So we’ve decided to upgrade this build with 16 GB of the Corsair Vengeance LPX. Our advice is always to go dual-channel, in this case, that means getting two 8 GB RAM sticks to pair up because if one of them dies you still have the other to at least be able to boot up your PC. Although, if you’re looking to cut some corners, you can get a single 8GB stick not and then purchase the second one whenever the opportunity presents itself. Just make sure you don’t overdo it! There’s absolutely no need to equip your gaming rig with more than 16 GB of RAM. 32 GB is not future-proof; it’s much more likely that DDR4 memory will become obsolete before you’ll need that many gigabytes for gaming. Technically you could’ve skimped on the motherboard a little bit, left room for more storage maybe. It goes against the base gamer instinct to invest a lot into a component that doesn’t directly impact gameplay (at least overtly), but we feel that the Gigabyte Z390 UD is your best bet here for a couple of reasons. First and foremost, we have the i5-9600K, which is a CPU that you can overclock, so you naturally need a motherboard that supports overclocking and one that supports this CPU out of the box. 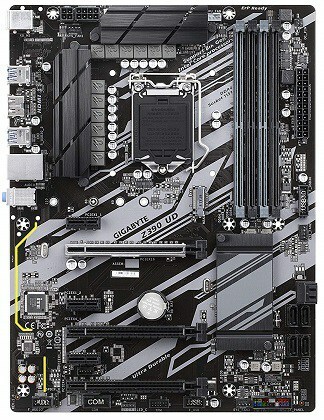 But what’s just as important is that the Z390 from Gigabyte keeps within the theme of upgradeability. This motherboard supports pretty much everything you could want to plug into it in the foreseeable future, even 2-Way CrossFire for multi-GPU setups. The build is sturdy, the materials good and it even supports some RGB lighting as an icing on the cake. Now when it comes to storage, you basically have two options. Either buy a 200-ish GB SSD for your Operating System and the most important games and a larger HDD for everything else or go all in on SSD. And honestly, it’s not like we can say that either option is plain better. Here, more than anywhere else, you’ll have to make a choice depending on what kind of user you are. If you need a dumping ground for family pictures, videos, loads of movies you’ll never watch and the games you’ll keep installed despite never playing them (we’re not judging, happens to all of us), then sure, it doesn’t matter how fast your storage is. But we are trying to build a gaming PC here, and games will thank you for the faster load speed. And with how large the newer AAA games are becoming, it’s quite possible that the first option could only account for the OS and just a couple of games on the SSD space. The Western Digital Blue 3D NAND SSD may not be the most affordable SSD you could find, but if you’re already going to be storing some valuable personal information on it you’ll want some assurance that it won’t die on you randomly and this is precisely what the WD brand offers. As for HDDs, the Western Digital Blue 1 TB is a pretty good option. It’ll cost just a couple of extra bucks coupled with the 250 GB SSD version, so if you were shaking your head disapprovingly at the thought of only having 500 GB to play around with then this is the option for you. It’s very easy to undervalue the PSU when building a PC, especially if you’re new at this. But it’s when dealing with the PSU that you have to be the wariest of low-quality products by shady manufacturers. Order a GTX 1060 with 5GB of VRAM from China off of Aliexpress (they do exist), and the worst case scenario is your GPU dies on you after a week. Sure, it could cause some collateral damage on its way out, but that pales in comparison with that a poor PSU can do to your computer. It can literally fry the other components. That’s why it’s very advisable to pick a PSU made by a reputable manufacturer and preferably not one cheaper than $50. In addition of being made by Corsair, a very reputable and trustworthy manufacturer indeed, the TXM550M has other merits going in its favor. It’s very power efficient, works at an operating temperature of 50°C and it sports a great rifle bearing fan that’s quieter than most. Plus it’s semi-modular, and in our eyes not having to deal with the cables that you don’t need is always a plus. Not to take anything away from what we said about PSUs, but the case is by far the king of undervalued components when building a PC. Many beginner PC builders don’t even take it into consideration at first. And even if you do, it’s the item you’re probably most likely to skimp on. And we can certainly understand why this instinct is there, but it’s something to overcome. Yes, a computer case is essentially a place to store all your hard-earned pieces of hardware, but it’s so much more than just a plain old box. A good computer case is built to offer the most optimal airflow that will facilitate cooling. A good airflow will go a long way in prolonging your PC’s longevity. What’s more, quality computer cases are generally on the heavy side so that all the cooling fans won’t make it rattle like a washing machine. And while the Fractal Design Focus G case is by no means high-end, it has the weight and the airflow make it a worthwhile investment to make sure all the aforementioned components can give it their best. Plus it has a gaming vibe and it comes with two preinstalled case mounted fans, which is just perfect. If you’ve been keeping tabs on the prices of all the components we’ve listed already, what you may have noticed by now is that this guide works under the presupposition that you already own a computer from which this gaming rig would inherit all the necessary peripherals. The $1000 all go into the computer case and its contents. Hopefully, this is the case, because if not, then all that the $1000 would land you is a metal container jam-packed with impressive pieces of hardware. But even if this isn’t the case, certain peripherals like the monitor from your old PC would most likely not fit into this new rig very well. With that in mind, we’d still like to dedicate a section of this article to all the best-suited peripherals to draw out the full potential of your new gaming PC. 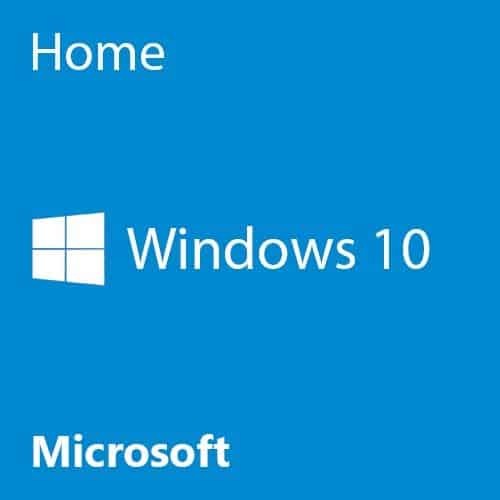 As for the OS, you’ll be running this machine on, we can’t in good conscience recommend anything but Windows for gaming. Linux may have its perks, but for every one of them, there’s also a downside. Some of them we could overlook, but not the fact that Linux simply isn’t compatible with every game that Windows is. What’s more, it’s also not as well optimized for gaming as Windows. This means that the exact same game on this exact same hardware will play differently on the two operating systems, with Windows clearly in the lead. With a $1000 gaming PC you should strive only for the best, but Linux does have the benefit of being free. If you do, in the end, opt for a Linux OS, the two we’d recommend you try for the best gaming experience are Steam OS and Game Drift Linux. The monitor is by far the most important peripheral. However, it’s easy to overlook just how instrumental it is in bringing your gaming rig to life if you differentiate them only by size and manufacturer. The best way to see which monitor is the right for you is by reflecting on what your graphics card is capable of and what you’ll be using it for. For 1080p gaming, the RTX 2060 is more than you’ll ever need. You’ll be able to play any AAA game on the highest settings with at least a smooth 60 FPS; which isn’t to say that you won’t be getting over 100 FPS in certain AAA titles. For example, you should expect the FPS to constantly hover above the 200 mark at maxed out settings in Overwatch, with a peak FPS of close to 300. Still, we don’t recommend going for a 240Hz monitor unless you’re an esports professional since their value is rather dubious. This means that you’ll find great value in buying either a 144Hz 1080p monitor or a 60Hz 1440p monitor. 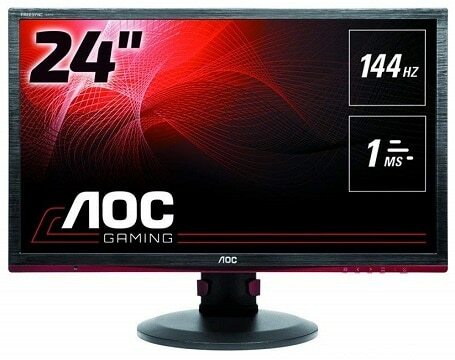 If you’re more interested in the former, then the best option that fits the bill without costing you an arm and a leg is the unimaginatively named AOC G2460PF. Just make sure to get the 24-inch model because it really is the sweet spot for 1080p monitors. And if larger resolutions are more to your liking, then the ViewSonic VA2719 is the ideal pick. Sure, it only has a 60Hz refresh rate, although you’re not likely to need much more in 2K resolutions if you’re also trying to make the game look as good as possible. But most importantly, it’s an IPS monitor, which means the image will be gorgeous. And with a 27-inch monitor, you’ll be much more immersed into whichever title it is you’re playing. It doesn’t get any better than this unless you want a 144Hz 2K IPS monitor. If you’re fine burning a hole in your pocket even after spending the initial 1000$ then, by all means, knock yourself out with something like the ASUS MG279Q, but seeing how this monitors easily cost half your entire hardware budget, it’s best to stick to either 144Hz FullHD or 60Hz 2K for now. And besides, the RTX 2060 is powerful, but it’s not that powerful. We’ve gone on a bit of a rant in the monitor section, but in many ways, it really is the most important peripheral for bringing your PC to life. It’s not as if we don’t have equally as much to say about mice and keyboards especially, whether to go mechanical or not, whether you buy one proportional to the price of the other components or go big because a good keyboard can outlive any other part of a PC, peripheral or otherwise, etc. 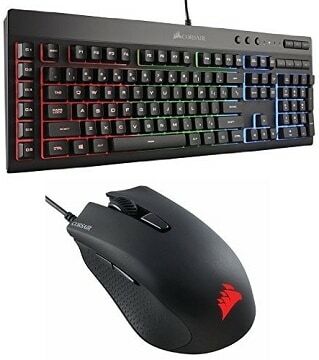 Instead, we’d like to present you with one of the most cost-efficient keyboard and mouse bundles out there. The Corsair K55 RGB keyboard is a membrane keyboard that is jam-packed with features like RGB lighting, programmable macro keys, and multimedia controls. Its partner in crime, the Corsair Harpoon, has everything you could ask for in a budget gaming mouse, with two programmable buttons, DPI modes that go up to a ludicrous 6000 and textured rubber grips. If you require something more refined then we suggest checking out our lists for the best gaming keyboards and the best gaming mice, but as for this article, we’ll leave it at this. For the longest time it used to be that controllers were synonymous with console gaming, but that time has passed. Nowadays, there are games on the PC that you can’t even run without a controller. If we exclude indie games, the amount of titles that get ported to PC from consoles far outnumbers the number of titles that get developed for the PC first and foremost. And these games were all designed with the controller in mind. Some have great ports that make the controls functional on the mouse and keyboard, while others are more like Dark Souls 1. 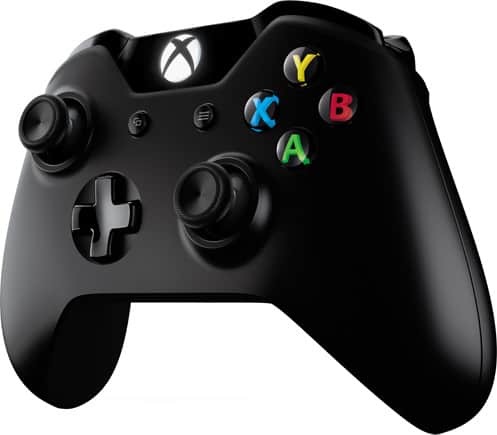 The two biggest controllers are the moment are the Xbox One Controller and the DualShock 4 and while they’re both excellent, we recommend the former solely on account of being able to do everything the latter can and then some. Oh, and the plug and play support, of course, since you’ll be using Windows as your Operating System. We have a whole video about this if you’re interested in knowing why we feel the way we feel regarding this matter. In the meantime, if you need something more affordable (or something more extravagant), we highly recommend giving this guide a read. 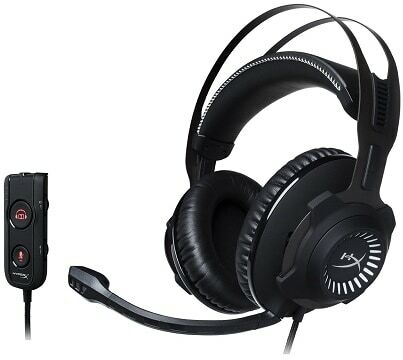 For most of us, headsets and headphones are the way to go to truly immerse ourselves in diverse gaming worlds. Speakers are great and all, but unless you have a truly dedicated and isolated gaming den they can be an inconvenience to your family. What’s more, they won’t do much to sever the connection with the real world. The HyperX Cloud Revolver S may not be the cheapest gaming headset out there, but it more than makes up for it with its features and quality build. They’re durable, they’re comfortable, and they sound great. And the detachable microphone comes equipped with noise-cancelling capabilities. And to top it all off, they come with the 7.1 Dolby Surround Sound. Although if this isn’t something you care about you can get the stereo version for 30 bucks cheaper. Finally, they’re excellent for gaming because of their compatibility, which extends to PC as well as the PS4 and the Xbox One. We must have mentioned at least twice by now that this build is ready to tackle Streaming. The way we see it, there’s nothing like a webcam to help get your streaming channel to pick up steam. After all, the most popular streamers all use cameras and that’s because people don’t tune in to their streams just for the games, they come for the unique content. 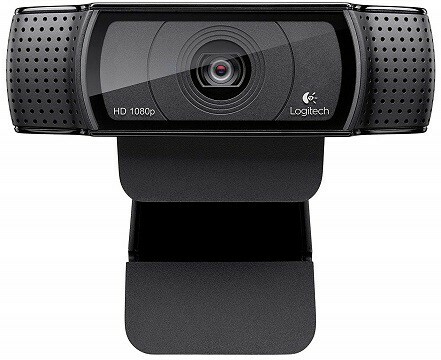 And there’s no better or more cost-efficient webcam out there than the Logitech HD Pro C920. Its specs are simply amazing (15 Mpix, 1080p resolution), and they’re made even better by the excellent technology that this webcam is packing. One of this setup’s biggest appeals is it strong enough to support VR. VR works with this build similarly to 2K in that it’s something you can take out for a spin, but not truly push to its limit. Nevertheless, it still opens up a world of possibilities that weaker gaming rigs don’t have access to. But you will need a VR Headset. At the moment, you have three options: The Oculus Rift, the HTC Vive and the PS4 VR. 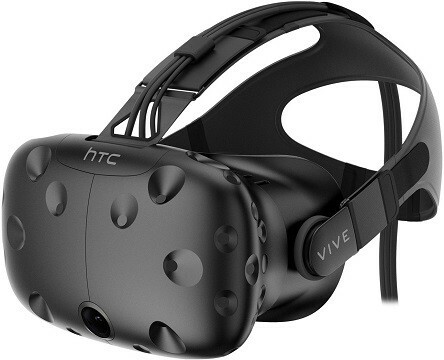 We prefer the HTC Vive because of SteamVR, which will even let you play certain titles in VR that weren’t developed for it. Besides, you’re more likely to have an exhaustive library of games on Steam than on the Oculus store. But if VR is something you’re seriously considering then you can read more about these headsets here and watch this video to understand why we don’t think the PS4 VR is as good as the other two on PC. Here’s something you never knew you needed – a wrist rest. 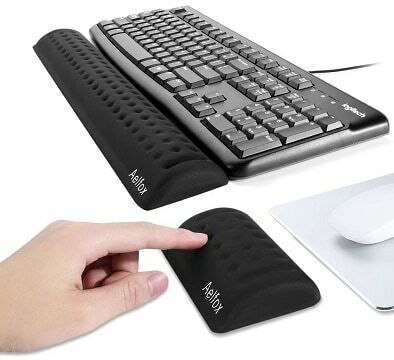 The Alefox Wrist Rest is an absolute pleasure to use, giving you nice, soft and comfy memory foam wrist cushioning for both hands. Just be wary, once you try the Alefox Wrist Rest, gaming without it will never be the same again. Now all that’s left is to actually assemble all these components into a functional whole. If you’re a first-time assembler than it may seem like a daunting undertaking but believe us when we say that mustering the will to do it is the most difficult part. Unfortunately, we can’t help you with that part, but for everything else, there are plenty of videos like this one to help guide you through the process. We hope you enjoy gaming on the best PC that 1000 USD can get you right now.